Some of this stuff is going to be under the "do not try this at home...or ever..." category... just a quick heads-up. Because I think you can learn just as much from the training mistakes I've made as from the stuff that turns out great. I'll start with the most dangerous one right off the bat here. At the time, I had worked up to being pretty strong with handstand push-ups, which are a GREAT exercise. So I decided I try and get greater range of motion by using a pair of dumbbells, setting my hands on the handles. I started with a pair of hex dumbbells (they didn't roll...should've stayed with those!). The first set felt good, so I got a pair of round dumbbells and set them so that the handles were parallel to each other (i.e. neutral grip), meaning as I did the handstand push-up, I had to also fight to keep them from rolling OUTWARDS and dropping me on my head. Naturally, this still apparently wasn't hard enough...so I decided to set my hands on top of the PLATES of the dumbbells (same position). I kicked up into the handstand, did 3 very tough, very wobbly reps, and then realized how much of an idiot I was being...put the dumbbells away and never did it again, luckily with an intact spine. Done properly, the Handstand Push-Up is one of the absolute BEST shoulder exercises you can do. If you're serious about upper body strength, you need to learn it. I do it with my feet on the wall, not freestanding, just FYI. Works like a charm. This second exercise was another case of me taking balance training too far to the point of being stupid about it...and it's shaped my ideas about balance training (and the sheer pointlessness of some of it) ever since. Basically, I would take a heavy dumbbell (like a 100 pounder so it didn't move too much) and stand on the handle on one foot. Then, holding a pair of small dumbbells for counterbalance, I would come down into a full pistol squat (i.e. 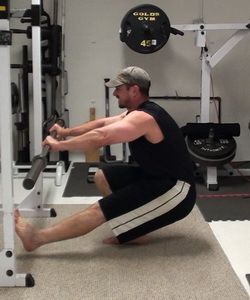 one-leg squat with the non-working leg pointing out front) then back up. I got to the point where I could do 3 or 4 reps without having to check my balance or step off the dumbbell handle. What good is this doing me? And the answer was clear...this kind of balance training is completely pointless for building real strength and sheer power. If I was training for the circus, it would be appropriate, but I wasn't (and still not). The risk/reward ratio was completely off. If you want to train balance, hold a pair of heavy dumbbells in your hands and stand on one foot (just flat on the floor) for as long as you can on each foot. That's it. Every little stabilizing muscle in your ankles will fire and get worked in a matter of 30 seconds. Simple...effective...and very low risk. This one is actually just in the "insane" category in that I still think it's an EXCELLENT exercise...just a bit nuts and requires TREMENDOUS strength in the triceps to do. First, I want you to think of a standing overhead tricep extension done with a barbell. You start with the bar overhead at arms-length, close grip. Then you bring the bar down behind your head, bending only at the elbows. Good. Now flip it upside down. Instead of the weight moving up and down, the BODY is moving and the BAR is fixed. It's like a handstand push-up done in a "tricep extension" format. And I used to do these all the time. I really think it's a major reason why my triceps look like big, meaty tumors on the back of my arms now. Now obviously, this version of the exercise required a LOT of building up to....and healthy elbows. It is absolutely INSANE. However, the easier version of the exercise can be done by a total beginner (I know because I've coached total beginners on it)...just use a horizontal movement pattern when a bar set 2-3 feet off the ground. Then, just by shifting the feet further away and/or lowering the bar, you can make it more challenging for more advanced trainers. This version pictured below is done using a cable handle for greater instability (very effective, too, though the "main" version is done on a solid, unmoving bar). I've got this one in my book "The Best Bodyweight Exercises You've Never Heard Of"
Now, some of the bodyweight training that I do also involves extra resistance...so it's not always PURE bodyweight training. That being said, picture this...kneeling on the seat of the Seated Calf Raise machine, facing away from the weight, shins on top of the seat, ankles hooked under the pad for bracing, machine loaded with a TON of weight to counterbalance. 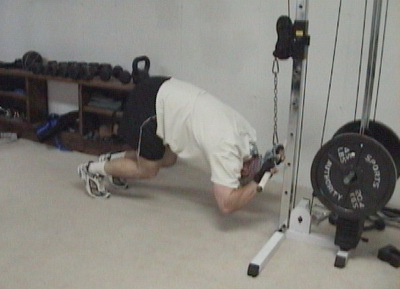 Then, using HAMSTRING power, "leg curl" your entire body back up. Got it? Now imagine holding a 110 lb dumbbell at your chest on the way down for a controlled eccentric-focused rep...(that's the weight I had worked up to). At the bottom, set it on the bench, help yourself back to the top position then grab the dumbbell and go again. IMPORTANT! This exercise will SHRED your hamstrings if they're not ready for it, so if you want to try the exercise, DO NOT do it with additional weight...use just bodyweight. Take it slow and be ready to catch yourself with your hands if you need to. 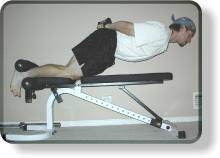 You can also do this exercise on a specialized bench (that has ankle posts built in) or using a lat pulldown machine seat (brace your ankles under the knee pads). Barring that, you can have a partner hold down your ankles or wedge your feet under something solid (use a towel for knee padding). If you're interested in more bodyweight training, check out my book "The Best Bodyweight Exercises You've Never Heard Of"